I have almost always been in a business related to TV since I was sixteen. I started working for Hobart Francis at Francis Radio and TV, an RCA dealer in London, Ohio then. I worked for him on and off for about eight years. Later I got into cable television. I have pretty much been a cable guy in one form or another ever since. I worked as a microwave television broadcast engineer for a number of years. I’ve always been interested in video hardware. I still enjoy hooking up video systems. The complexity of systems I have built ranges all the way to QAM digital. I am an expert at analog television and distribution networks. Currently I help construct modern bi-directional coaxial networks, but I would have to say most of what I know was originally inspired by one thing. 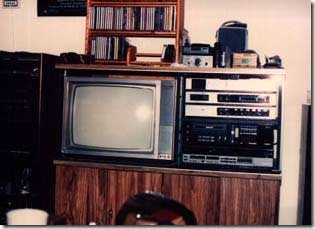 I had a Zenith baseband video/audio system in the 1980’s that was built out of individual components, like a home stereo system. It was all standard audio component size too. I believe that is the niche Zenith was trying to fill with it. They wanted to replace mid-grade audio systems and begin to integrate audio components with video gear. Not a bad idea. Maybe a little too ahead of its time. It was a line of TV’s that Zenith made for a short period called VHT, for Video High Tech. It had a baseband cable ready tuner, a baseband video/stereo audio /RF switching unit, and a separate 19" RGB monitor. The retail price of the Zenith components alone were about $1200, and that was about 1984. It also had it’s own stereo amp and speakers. It had many standard audio amp features, but was only about 25 watts per channel. I used my higher powered stereo for the TV usually. Later I bought a surround decoder and used the Zenith amp with it. I probably had close to $3000 in the whole system in the end. There’s something very quirky about The Cardigans that I have always liked. One minute they’re a soft pop group, the next a hard alternative band. This song, My Favourite Game is more the latter than the former. On the CD you can hear they recorded a buzzing bass speaker enclosure that actually fits right in. Just recently I found out the old Burger Chef in London, Ohio had burned down. They said that the fire was suspicious, but I have never heard what they ever found out about it. More recently it had been a Rax restaurant. Thirty-five years ago it was in the busiest part of town, but that activity mostly shifted about two miles to the north-east twenty years ago now. I remember when they built the Burger Chef in the early 1970’s. 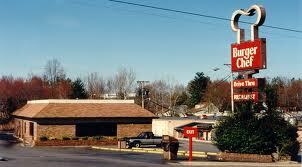 It was the first real fast food restaurant and had the first drive-thru window in town. My sister got a job there and I was treated to one of the first meals served at the restaurant during a family night event they held the night before the grand opening. There were about twenty to thirty people, all standing at the counter ordering free food. You would have thought civilization had finally just come to London after all these years looking at everyone’s faces. The previous popular teenage cruising loop had been from the Dixie Drive In to the Red Baron restaurant. That was probably about three miles and five traffic lights long. Almost immediately the Burger Chef became the main part of the new loop for the local cruisers. You would get a mix of local hot rods, hot rod wannabe’s and teenagers in their dad’s four door sedans driving through the parking lot. Cars and people would be everywhere, especially on a summer weekend night. On those evenings, the parking lot would be full. There would be people just milling about and on bicycles. Kraco 8-tracks players with Bass 48 wedge speakers battled Craig Powerplay car stereos with Jensen Triaxials for audio dominance. There were houses across the street and most of the time the residents would sit on the porch to watch the procession of cars and people. When I was born, my father insisted that I be named after his father, Alex (pronounced ell’-ick) Fisher, instead of him. Of course his real name was Alexander. When my father Gerald was born, his father had also insisted that he not be named after him. In both cases, my father and I were given the initial of their father as a middle name. Somehow later my father’s middle name was changed from just "A" to Denver, though not ever legally as far as know. I however, am still Alexander G Fisher. When I turned sixteen, of course the first thing I did was take the test at the BMV to get my learners permit. I didn’t have a car and was just planning on buying one, driving my dad’s car, or something. Having my learners permit was something I had looked forward to for a long time. I had seen the drivers license examiner many times. They had the testing in the American Legion hall for years. The hall was just a block from my school, so I had seen him outside having license applicants parallel park on several occasions. The examiner was an officious looking man who wore a blue police type uniform everyday. I had heard from others he was hard to deal with, but what I experienced that day was something I was totally unprepared for. When I entered the hall I had to wait in line to get the test. During that time, I noticed the examiner was being mean to everyone. It just seemed like it didn’t matter to him whether you were white or black, rich or poor. He was an equal opportunity cranky jerk. He handed me my test without any incident. Then I went to a desk nearby and I completed the test. I had studied for the last two years, so I was certain that I had passed. The Cardigans with Tom Jones "Burnin’ Down The House"
Here’s a very cool video of one of my all time favorite bands, The Cardigans featuring Tom Jones singing Talking Heads‘ “Burnin’ Down the House”. I am also a big fan of Talking Heads and probably wore out my cousin’s copy of Tom Jones‘ “What’s New Pussycat” in the 60’s. Tom always seemed cool, but this proves it.